Early Cadastral Map detailing lands and properties in th Upper West Side of New York City, between 85th and 89th Streets, Central Park and Broadway. 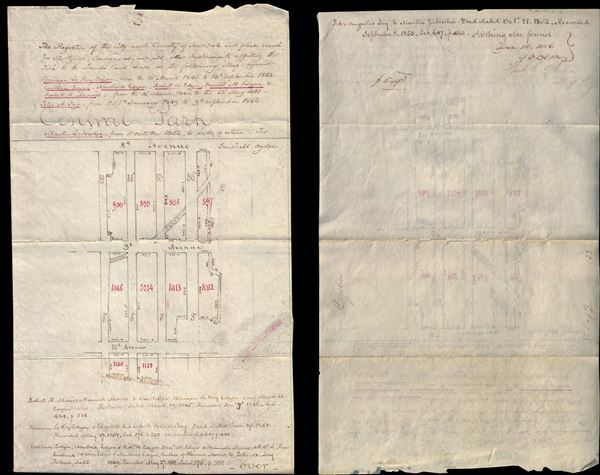 An uncommon early manuscript cadastral map and document recording land transactions on Manhattan's Upper West Side, near Central Park. The manuscript, dated 1856, features an eastward oriented manuscript map detailing the street and property lots between Central Park and Broadway, here identified as Bloomingdale Road, and between 85th and 89th streets. This area includes parts of modern-day Central Park West, Columbus Avenue, and Amsterdam Avenue. The map is a request to the city to search for mortgages, liens, and other conveyances associated with these lands and the deeds that hold them. The map features some of New York City's most prominent names, including Peter Augustus Jay (son of John Jay), Herman Le Roy Edgar, William Edgar, Newbold Edgar, Robert R. Morris, Hannah Morris, and Martin Zabriskie. The document is no doubt associated with property disputes related to Stillwell Lane (near modern day 85th Street) and associated lands. This was prepared for Gouverneur M. Ogden, an early trustee of Columbia University. Central park would have been in the early stages of construction when this map was drawn. Such maps are rare and provide a unique insight in to the urban development of New York neighborhoods. Good. Manuscript pen and ink on vellum. Some fold wear and minor loss at centerfold. Soiling.